Do you wish you could entertain more but the thought of making appetizers and having drinks for everyone might be too overwhelming or simply out of your budget? Have you ever thought of hosting a Coffee Party and just inviting a few girl friends over after the kids are at school and offering, coffee and maybe a few purchased or homemade treats? The best thing about a coffee is it can be as casual as paper cups or pull out your best china. Best of all Design star David Bromstad has partnered with Coffee-mate and Target, making a splash with limited edition bottle designs inspired by coffee and Coffee-mate. to dress up your tables. Hosting a coffee is so simple and less time-consuming than a cocktail party, plus it gives moms a chance to get out of the house and talk to other moms. I love serving flavored creamers but never felt the regular bottles were really worthy of being out on the service table. The new David Bromstad designed bottles (French Vanilla and Hazelnut flavors) will be available exclusively at Target stores nationwide and don’t you think they add a little punch to the table? I found these new creamers in with all the other creamers and only in the larger size. 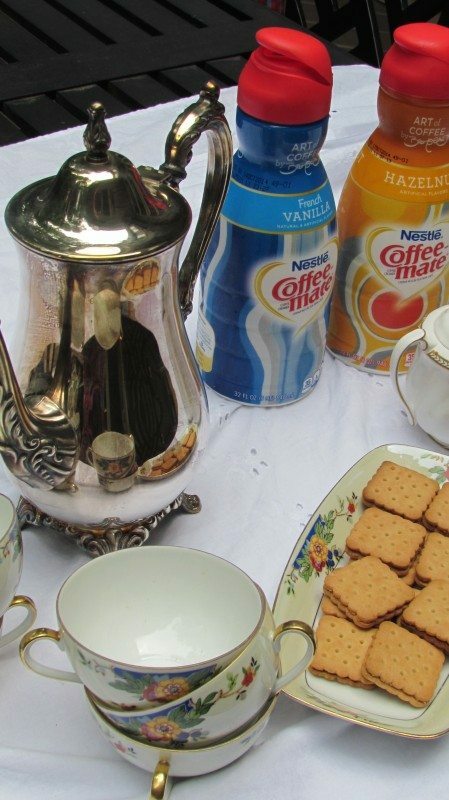 I brought out my Grandma’s China cups and my stainless steel coffee pot to show how you can set out these creamers for a fancy affair. Really not all that fancy just serving some store-bought cookies but you get the idea. What do you think? How does Coffee-Mate inspire me? Well unless I have my cup of coffee I am not worth much in the morning. 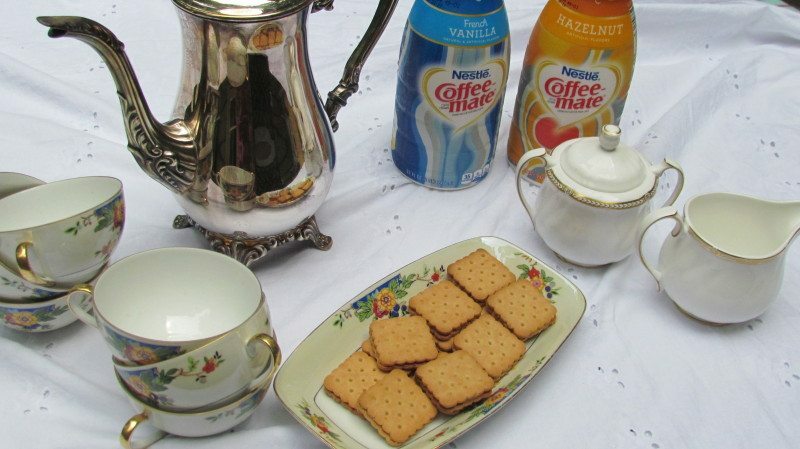 I don’t necessarily crave the coffee flavor but the taste of the flavored creamers I use. That first cup of coffee, which I try to drink before the kids come down, is really a time for me to take a deep breath and try to map out the day, the best I can. Coffee Mate does not just inspire me to wake up in the am, but it can also inspire me in the kitchen. I have made some fun recipes using Coffee-Mate creamers in the past. Check out our Double Chocolate Doughnuts , our Oatmeal breakfast Bar and our mini Oreo Cheesecakes. Don’t want to have a coffee party, no worries still grab David’s Coffee-Mate designs you could be worth $500. “For more inspired fun, snap a photo of the newly designed bottles and share it on Instagram or Twitter with the hashtag #CMInspiresSweepsEntry for a chance to win a year’s worth of Coffee-mate, $500 Target GiftCards, and a signed print from David Bromstad! Forget David, invite me. I love morning coffee and afternoon tea. The cookies look tasty too. Coffee mate is my favorite creamer. Not quite as sweet as the other popular brand which I like. Love yours grandma’s server. I love hazelnut cream! I usually buy the hazelnut beans (less calories in a black coffee than one with creamer) but once in a while I indulge 🙂 I’ll have to try out your recipe! I have to say, I am a big fan of fine china and coffee urns. I love the who set up you did for this post. Also a big fan of both David and Coffeemate… how great is that? Thanks for reminding me to take out my good china! I love the coffeemate flavored creamers. I enjoy the flavored creamers more than flavored coffee. I have been using coffee mate for years. I am going to check out the recipes that you referenced in your post. The double chocolate donuts sound fantastic. YUM! I love Coffee-Mate Creamer! This looks like a fun tea! I love the smell of coffe… but its the taste I can’t stand. so I’m more of a hot chocolate gal. My husband loves this stuff! I am not a coffee drinker but I have seen him run to Walmart at 10 at night just to get some more of this for morning. Coffeemate is very much a foreign concept for us – though it is on store shelves. Thanks for making it a little more approachable for us! LOVE LOVE LOVE Coffemate Won’t Use ANYTHING Else!! I get coffeemate in the fall when they have the pumpkin flavored. Yummm. It’s a great product. I love the tea set! It’s so cute! Every day I wake up I need something hot to drink to keep me going, I love using creamer in my coffee. What a beautiful setup you have there. I love using coffeemate as my creamer.